The early bird registration deadline for IPIC2015 has been extended to 17 July 2015, so make sure you take advantage of the great rates we have for you! 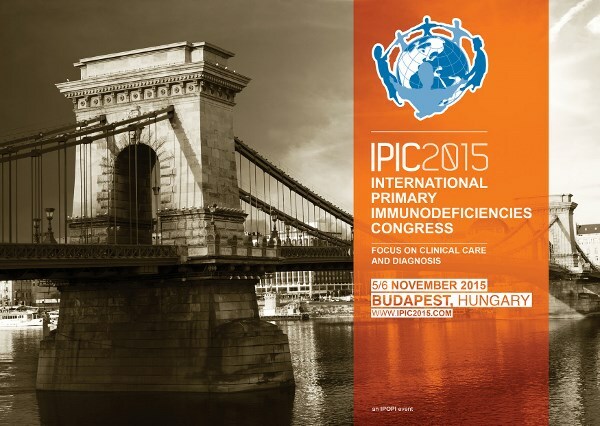 We are looking forward to welcome the PID community in Budapest for a great second edition of the International Primary Immunodeficiencies Congress (IPIC). We have an exciting programme outlined that will focus on key clinical developments of the Primary Immunodeficiencies field. IPOPI is offering junior physicians Travel Grants to help young physicians with and interest in PIDs to attend. To further promote and reward investigation in the field IPIC2015 will give monetary awards to the three best posters as well as the opportunity to present during the Oral Presentations session on Friday 6 November. IPOPI is looking forward to having its members represented at the meeting and was able to secure funding for six travel grant for NMO leaders with an interest in the clinical developments of PIDs. Participants of the congress will have the opportunity to network while enjoying the magnificent views of Budapest in the Danube river cruise dinner on the 5th of November. Budapest river banks are classified by Unesco as World Heritage for their outstanding urban landscapes illustrating the great periods in the history of the Hungarian capital.